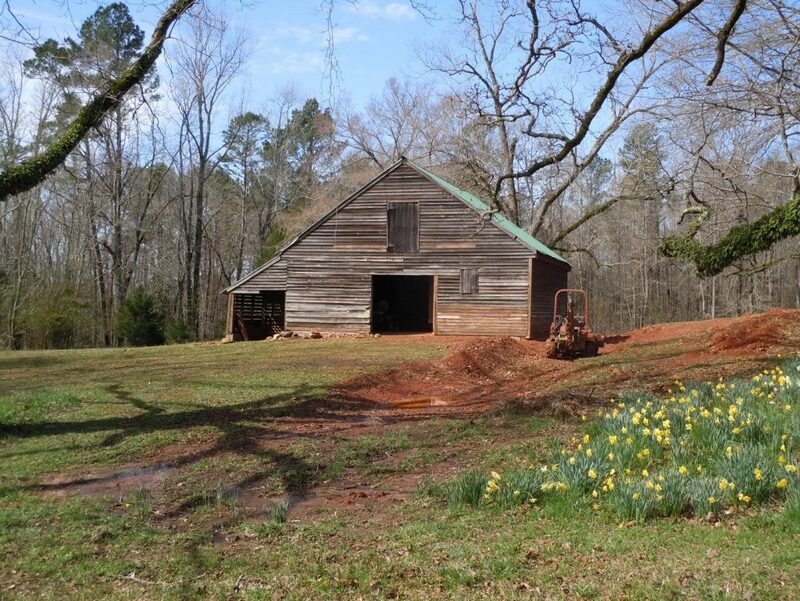 The heart and soul of the old plantation is Glen Mary’s iconic 1840 mule barn. 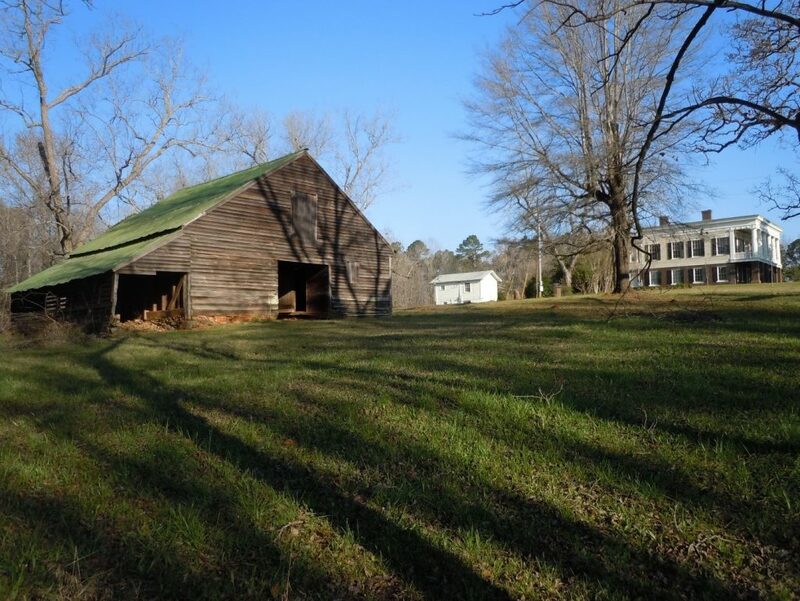 Other than the house, Glen Mary’s barn is the last surviving antebellum structure on this historic site. 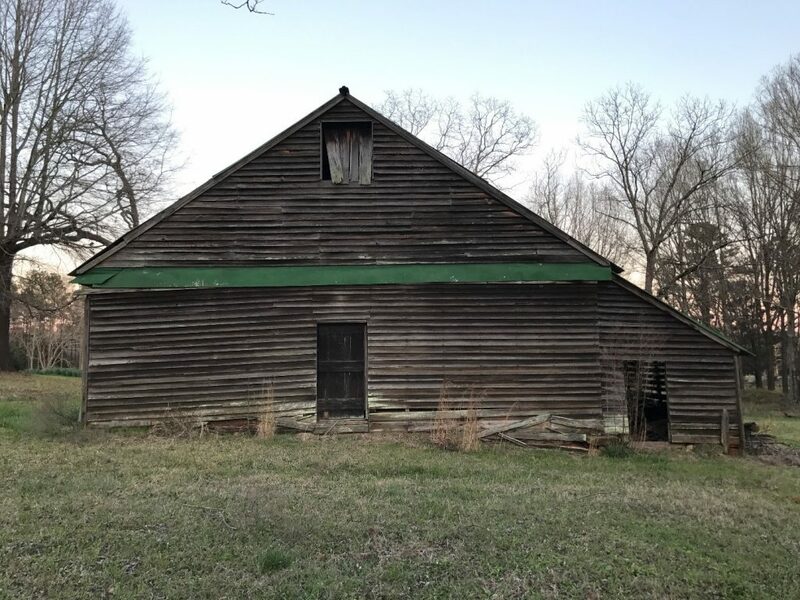 Saving this precious barn was high-priority! Over the years the barn’s condition had deteriorated to a desperate state and was in dire need of repair and stabilization. 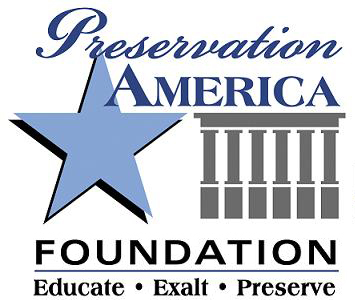 Preservation Americas’ goal was to ensure its structural soundness and longevity for another 150+ years! 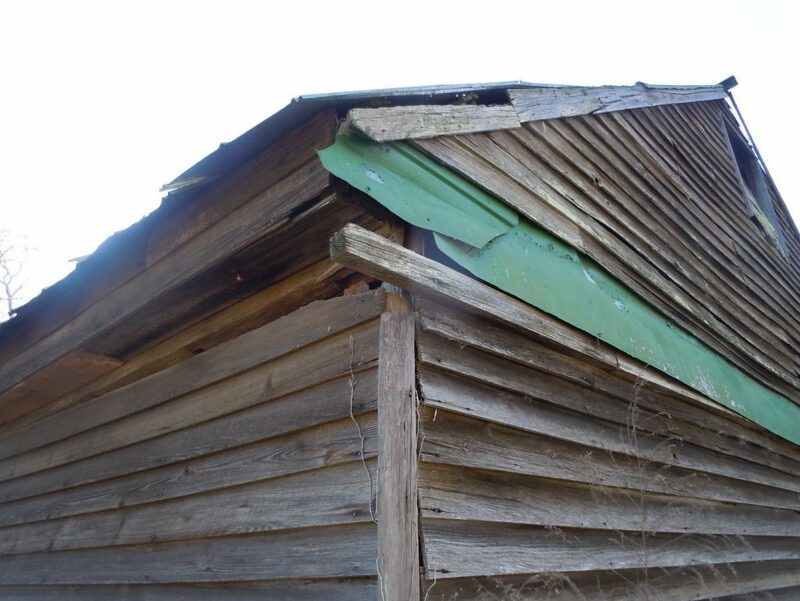 The barn was sagging and leaning due to the seriously decayed corner posts and timber sills. 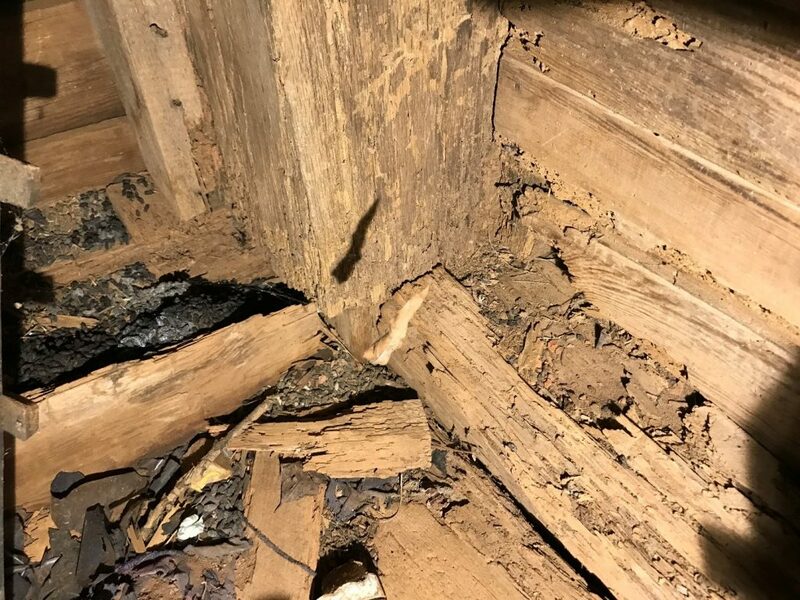 This condition had compromised the structural integrity of the original framing system. The sills, posts, infill studs and siding had all deflected downward producing a gap between the roof and the wall where water penetrated. 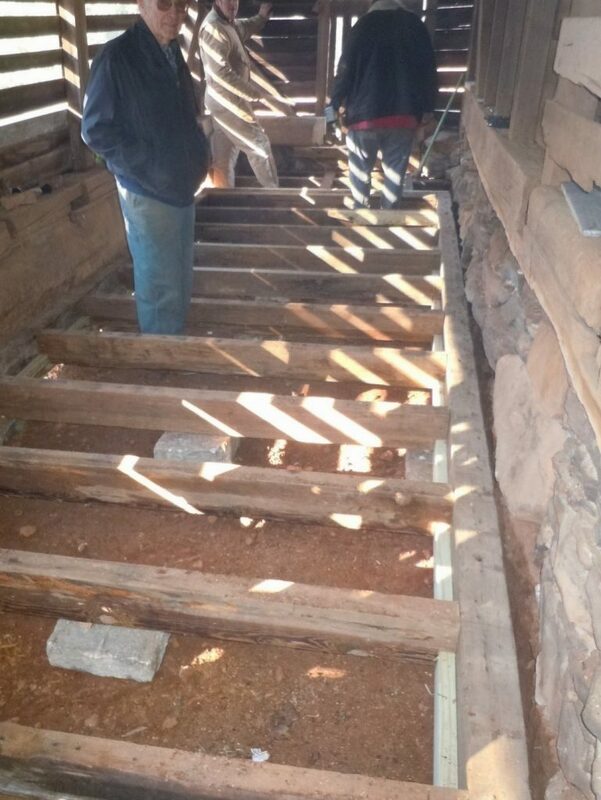 Some of the barn’s foundation sills had failed and were partially rotted because of moisture retention. It was our good fortune that two incredibly generous donors came to our aid and made this barn restoration possible. Washington Electric Foundation contributed the funds for the contractor labor costs for the north side of the barn and Dr. James Cantrell, professor emeritus at The University of Georgia donated the materials. Dr. Cantrell’s gift is of rare first growth heart pine timbers, a species that is not replaceable, as old growth heart pine is no longer commercially available as a crop. These are magnificent pieces of wood, some are huge, heavy and long, hand-hewn and notched where tendons were once placed. 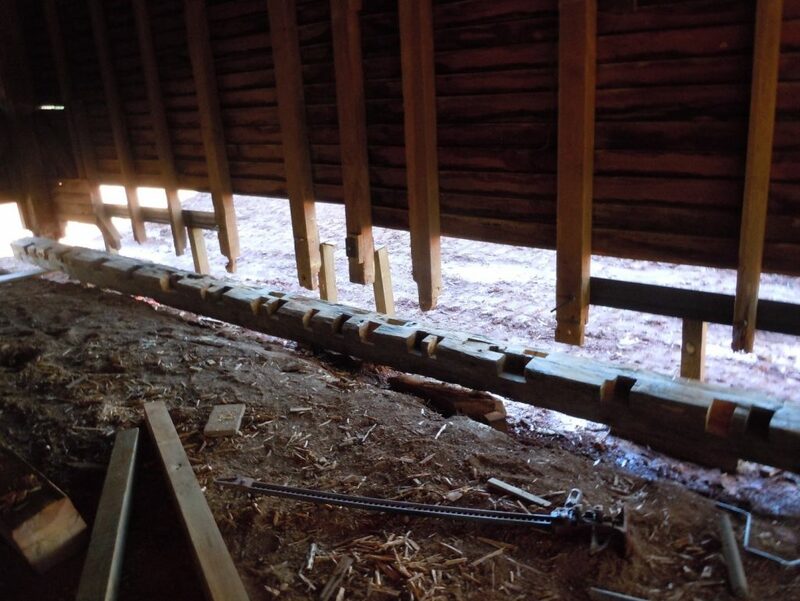 Dr Cantrell’s beneficence has enabled us to use replacement materials as close as possible to the same species timbers and the same size as used in the original barn construction. These materials assure that the historic character of the barn is retained and preserved. The barn restoration involved jacking up the north side of the barn where it was sagging. 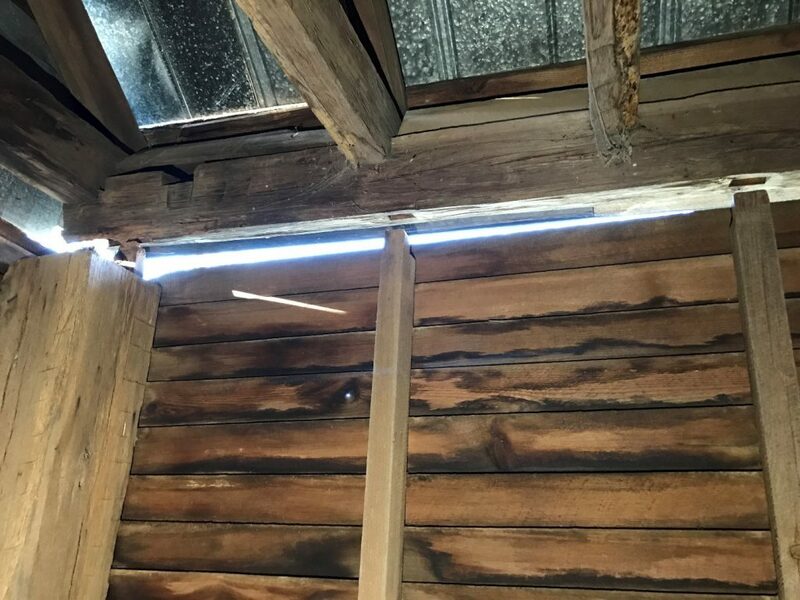 Working under the jacked-up barn, the contractors replaced the rotted sills and positioned the posts and wall studs to their original mortise locations. The barn was then level and sat squarely on its foundation. Rotted siding was replaced or repaired, as were barn windows and doors. 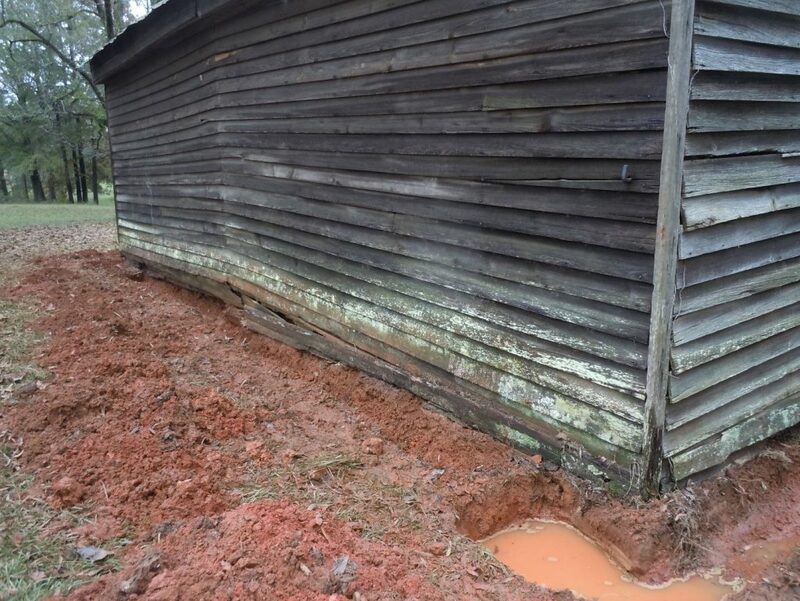 The corn crib was floored, and the building was further stabilized with a brick and granite foundation. The roof was painted and aligned correctly. Moisture problems were addressed by installing a drainage system of catch basins and drain pipes. Dangerous knob and tube electrical wiring dating to the early part of the 20th century was replaced with a modern electrical system. Overview of Glen Mary Plantation showing the various buildings in their respective locations. The mansion and cottage in location relationship to the barn. Overview of Back of Barn, West Façade. Left Corner of barn shows a significant shift downward. Other areas that need repair are the brick foundation, the timber sills, clapboards and the gable window. Exterior view of northwest barn corner. Notice the significant gap between the roof plate beam and the walls where downward movement caused clapboards to fall off. Walls not joined to roof. Roof fascia needs repair. Barn interior. Roof beam at corner is detached from adjacent beam. 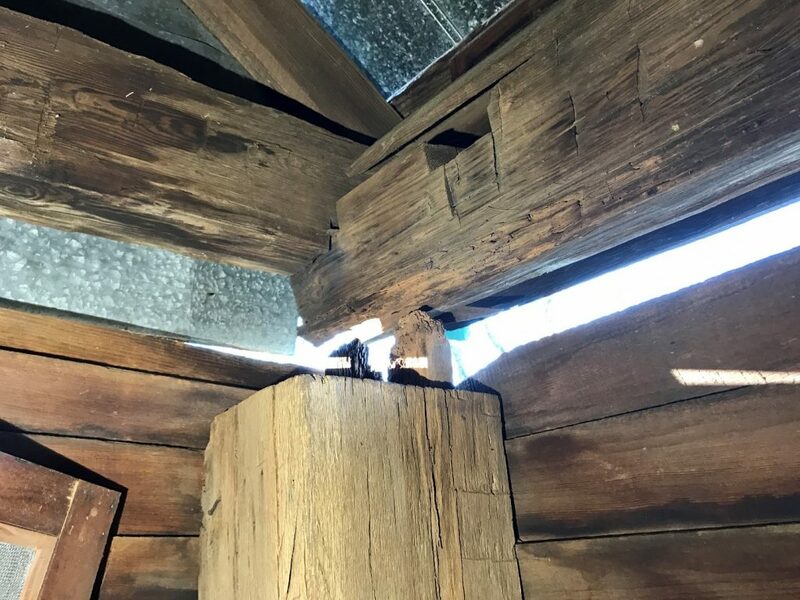 Original construction of the framing system at this corner has been compromised due to the top tenons no longer being in their corresponding mortise locations. Barn interior, northwest corner. Severely deteriorated sill. 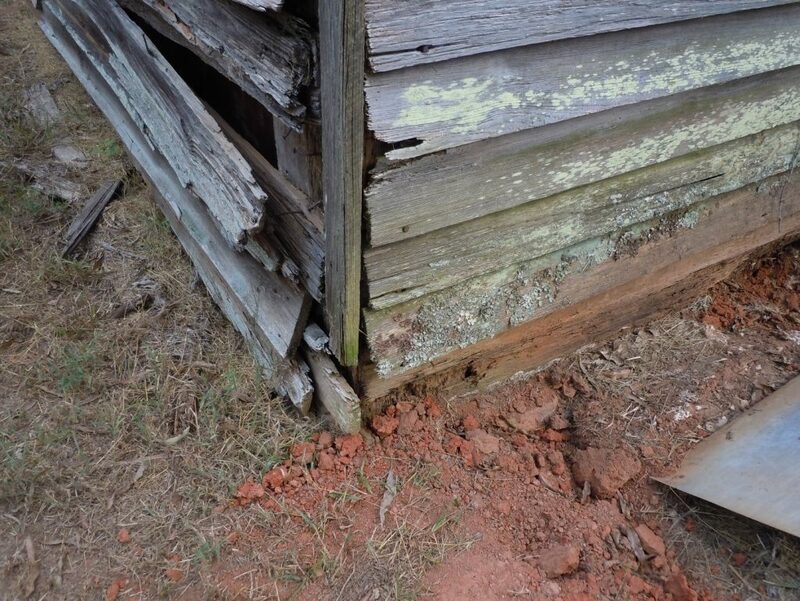 This image shows degradation of the corner post and adjacent sills that provide the structural integrity of the corner. 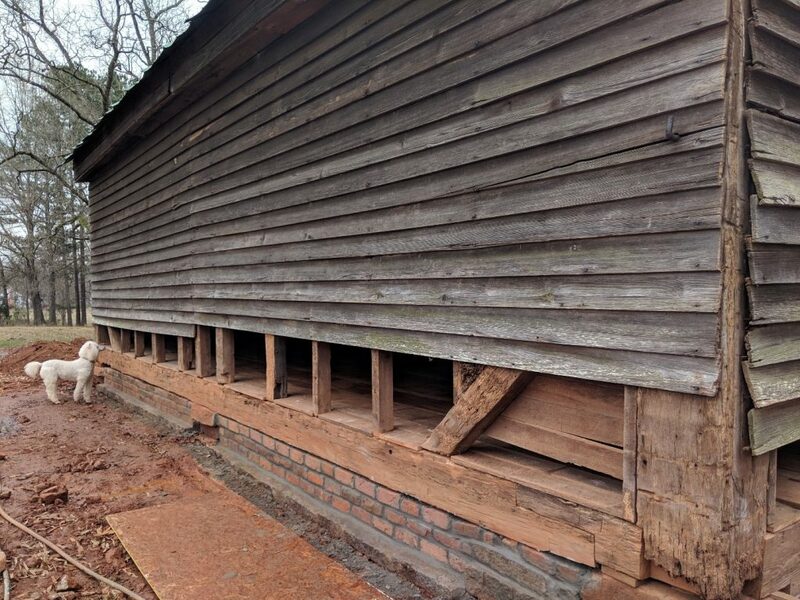 Barn Exterior, Northeast Corner, shows sill degradation, missing brick foundation and siding that is falling off the front of the barn (east façade). Barn interior. Wall studs and corner post are detached from roof beam. The top wall studs and the corner post no longer reside in their corresponding mortises. Contractors digging out, preparing to jack up building and remove rotted sills. In the foreground, Dr. Cantrell, donor of the rare heart pine sills, which were reclaimed from an 1838 deconstructed building. Contractors installing the replacement sill. Photo shows west and north facades. Barn structurally finished, February 15, 2019! Over view of finished barn. Ditch Witch is creating drainage system for north side of barn. 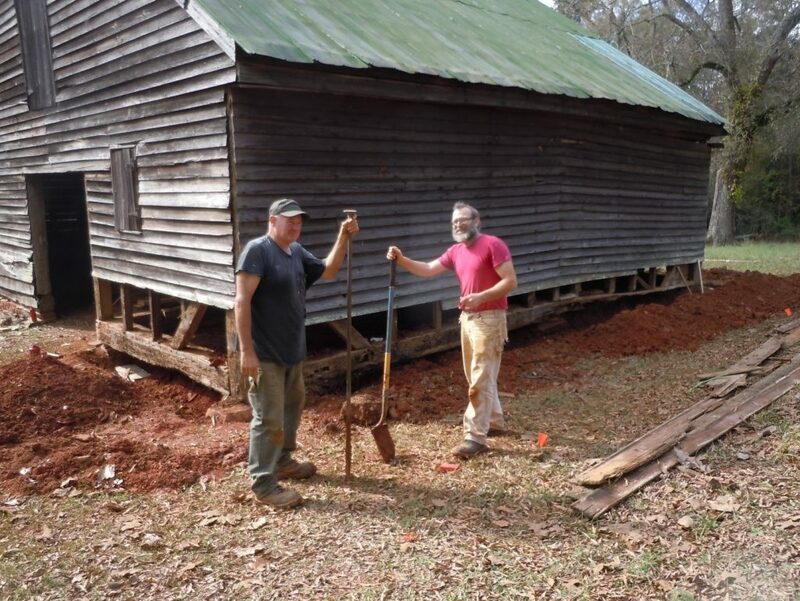 Photo shows rare heart pine timbers reclaimed from an 1838 house in Crawfordville, Georgia and donated to Preservation America Foundation by Dr. James Cantrell. 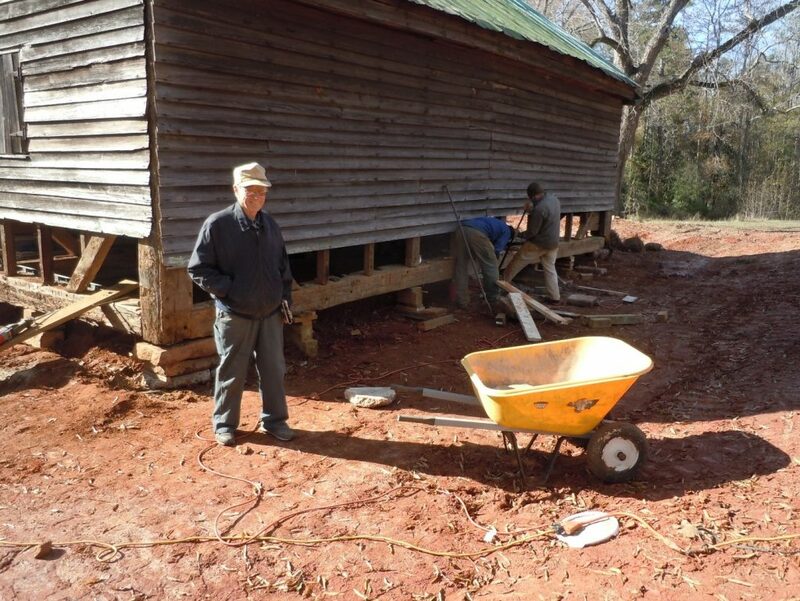 Dr. James Cantrell, professor emeritus at The University of Georgia generously donated the various rare timbers and granite stone blocks needed to restore Glen Mary’s barn. 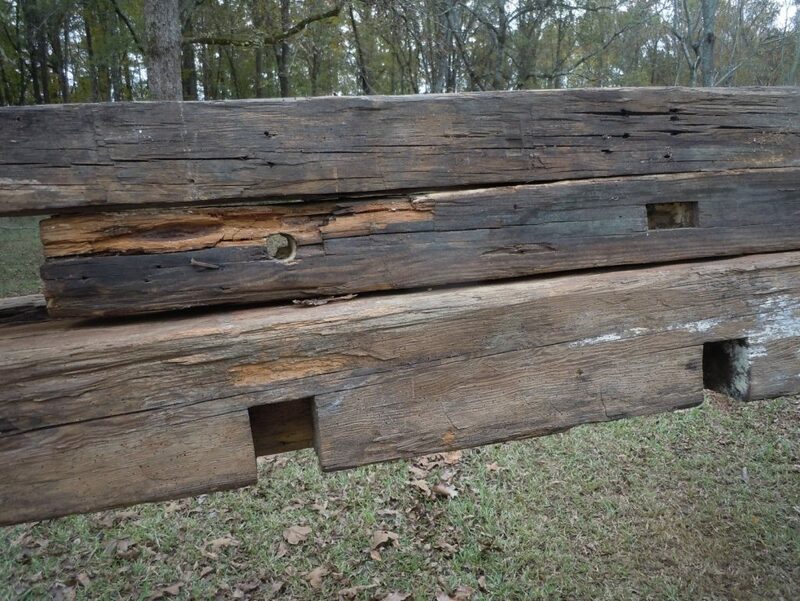 Dr. Cantrell’s rare salvage enabled us to use replacement materials as close as possible to the same species timbers and the same size as the original. Glen Mary’s ca. 1840 barn is built of timber species that are not replaceable, as old growth heart pine is no longer commercially available as a crop. Preservation America’s intention is to put the barn into public use as an event venue and a community asset.